This book describes how to use InterSystems IRIS XML tools. InterSystems IRIS brings the power of objects to XML processing  you can use objects as a direct representation of XML documents and vice versa. Because InterSystems IRIS includes a native object database, you can use such objects directly with a database. 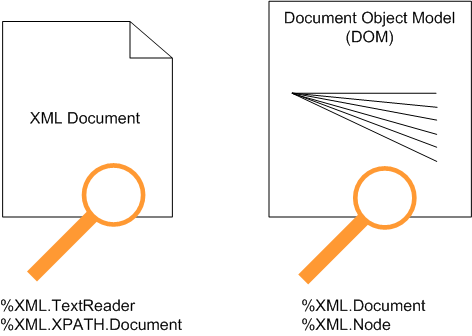 Furthermore, InterSystems IRIS provides tools for working with XML documents and DOMs (Document Object Model), even if these are not related to any InterSystems IRIS classes. Some of the InterSystems IRIS XML tools are intended for use mainly with XML-enabled classes. To XML-enable a class, you add %XML.Adaptor to its superclass list. The %XML.Adaptor class enables you to represent instances of that class as XML documents. You add class parameters and property parameters to fine-tune the projection. Because there are so many options, an entire book is devoted to them: Projecting Objects to XML. 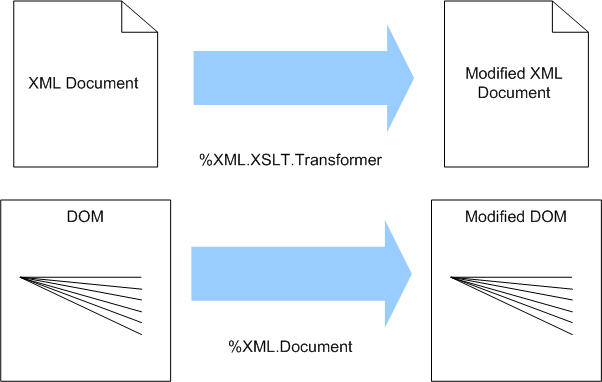 The InterSystems IRIS XML tools provide many ways to access data in and modify both XML documents and DOMs. You can also use InterSystems IRIS XML tools to create and work with arbitrary XML  that is, XML that does not map to any InterSystems IRIS class. To create an arbitrary XML document, use %XML.Writer. This class provides methods for adding elements, adding attributes, adding namespace declarations, and so on. InterSystems IRIS XML Tools use the InterSystems IRIS SAX (Simple API for XML) Parser. This is a built-in SAX XML validating parser using the standard Xerces library. SAX is a parsing engine that provides complete XML validation and document parsing. InterSystems IRIS SAX communicates with an InterSystems IRIS process using a high-performance, in-process call-in mechanism. Using this parser, you can process XML documents using either the built-in InterSystems IRIS XML support or by providing your own custom SAX interface classes within InterSystems IRIS. If the output destination is a string or a character stream, the default is "UTF-16". If the document is a file or a binary stream, InterSystems IRIS assumes that the character set is "UTF-8". If the document is a string or a character stream, InterSystems IRIS assumes the character set is "UTF-16". Encoded means encoded as described in the SOAP 1.1 standard or the SOAP 1.2 standard. For links to these standards, see “Standards Supported in InterSystems IRIS,” later in this chapter. InterSystems IRIS supports key encryption using RSA-OAEP or RSA-1.5 and data encryption of the message body using AES-128, AES-192, or AES-256. The InterSystems IRIS SAX Parser uses the standard Xerces-C++ library, which complies with the XML 1.0 recommendation. For a list of these standards, see http://xml.apache.org/xerces-c/. For information on additional standards related to web services and clients, see Creating Web Services and Web Clients and Securing Web Services. InterSystems IRIS does not support, within one element, multiple attributes with the same name, each in a different namespace.